Pregnancy is one of life’s miracles. You get to grow a brand new life from scratch and give birth to it – which your body is built to do. That moment you pee on a stick and see those two lines, your life has changed forever. It’s one of the biggest changes a woman can go through. Babies do not come with a manual, but pregnancy comes with many. Books like this are everywhere and you can read all about the symptoms you might experience. Once you get to the end of pregnancy, with a bump like a watermelon and a road map of stretch marks across your belly, you’ll have labor to look forward to. It’s called labor for a very good reason. It’s one of the most painful and empowering experiences a woman can go through in her life. Labor is often described in graphic detail, down to the last stage where the placenta is born. It’s after this that the real ‘fun’ begins, though. You’ve got your beautiful bundle in your arms safely and the rest of your life to raise your baby. However, there are a few things you’re about to go through that you may not be aware of, so take a deep breath and read on. Your womb expands to accommodate a baby, placenta, and fluid over nine months. That’s a lot of growth that’s gone on, and after that baby emerges, your womb will contract back down to its original size. You’ve probably read that’s going to happen in one of your baby books. But that shrinking is painful! 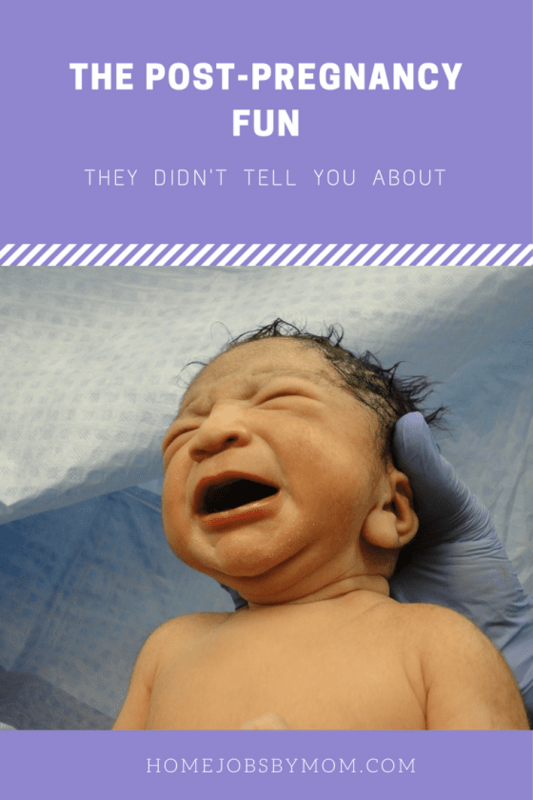 The contractions you felt when you went into labor were painful, but imagine having similar pains again, without a baby at the end? Yeah – that’s the after pains. They do get progressively worse the more children you have and are especially bad when breastfeeding, as the hormones make this process go faster. Thankfully, they don’t go on and on for hours but have painkillers handy to combat this. When your placenta breaks away, you are left with what is essentially is an open wound. You’ve not menstruated for nine full months, and this accumulation of blood needs to get out. You can buy maternity pads for your hospital bag to deal with this. Unfortunately, the bleeding can take up to six weeks to slow down so it’s a good idea to buy A LOT of these. The discomfort you feel after labor can sometimes be exacerbated by what feels like a huge mattress in your underwear. There’s a nifty little solution, though! If you soak your pads in witch hazel and place them in the freezer, you’ll at least have an instant soother! Pregnancy hormones stop your hair from falling out. There’s a reason that thick and lustrous hair is a sign you’re pregnant in the early days. Once those hormones rush out of your body, your hair has nine months of catching up to do and the shedding can be alarming. In some cases, it can get bad enough to need tablets for hair loss. It can be scary to be washing your hair in the shower and have handfuls of hair come out but don’t be frightened. It should slow down and there are products you can use to keep your hair from getting too damaged. Before you know it your hair will go back to its crowning glory. Postnatal depression is not talked about nearly enough and every woman who has a baby goes through a few days of the baby blues. There is a big difference between baby blues and postnatal depression, though. Make sure you understand what is normal and what needs immediate help. Pregnancy is a miracle, but no one said it was an easy one to handle. The trick is to be as prepared as possible and have a lot of support around you.